I love sending care packages, because I think it’s not only fun to get mail but to surprise other people it too. I haven’t sent as many as I’d like, since a) school, or at least avoiding schoolwork, takes up a lot of what would be my free time and b) I always worry about things being stale upon arrival. Future plans include compiling a list of yummy treats that stay fresh for a few extra days! 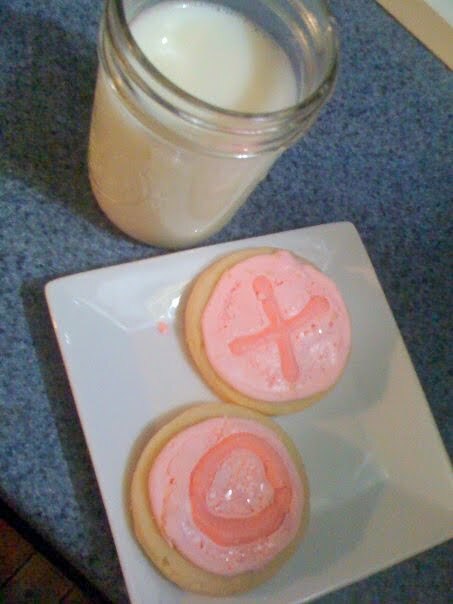 In Valentine’s spirit, I sent these to my brother who sent me a picture from his iPhone which is composed so much better with the milk in the cute jar, etc. than mine ever are. It cracked me up; he’s creative, what can I say. Hahaha These cookies were tasty!